Cairns, the major tourist destination of Queensland, Australia's Tropical North is the ideal location for exploring the Great Barrier Reef. Many of the international hotel groups and apartment operators have properties in Cairns, including Hilton, Holiday Inn, Ramada and Radisson. Local chains represented include Rydges, Metro Hospitality Group and Country Comfort. This property is situated on the Bruce Highway as you drive into Cairns from the south, and is approximately 5 minutes from the city. 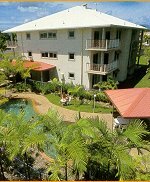 The 3.5 star complex has a mix of motel, hotel and serviced holiday apartments accommodation in a cool, tropical style environment near the Trinity Inlet in the Cairns City southern gateway. The property is a popular choice for Queensland, interstate and overseas visitors. While staying in this part of town, guests can access the nearby Cairns Golf Course, stroll next door to the local shops and McDonalds or get out and discover the natural wonders Cairns has to offer. The resort-style apartments are airconditioned and contain ceiling fans, a private balcony, televison, laundry facilities and a fully equipped kitchen. Motel and hotel rooms include ensuite, airconditioning, ceiling fans, refrigerator and tea and coffee making facilities. This affordable accommodation property, built in the mid 1990s, also offers spacious, easy access undercover parking.